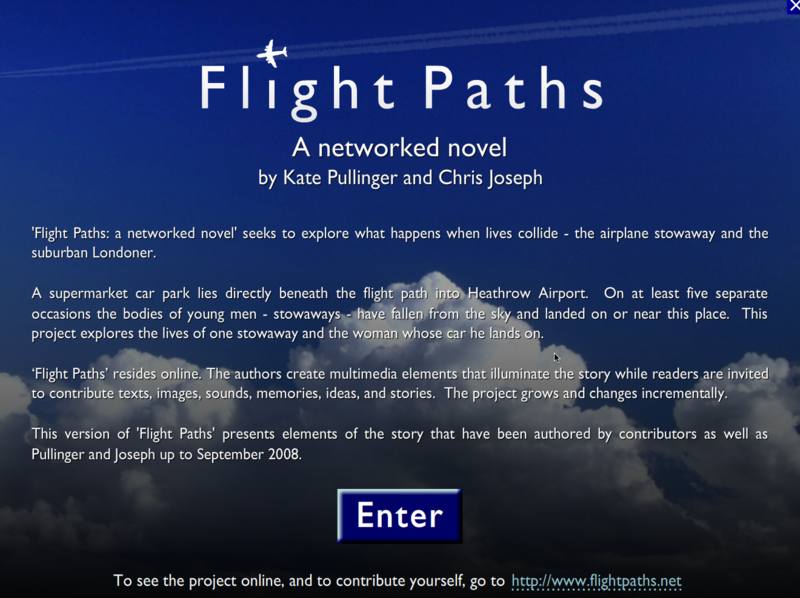 Flight Paths: a networked novel seeks to explore what happens when lives collide - the airplane stowaway and the suburban Londoner. A supermarket car park lies directly beneath the flight path into Heathrow Airport. On at least five separate occasions the bodies of young men - stowaways - have fallen from the sky and landed on or near this place. This project explores the lives of one stowaway and the woman whose car on which he lands. The authors create multimedia elements that illuminate the story while readers are invited to contribute texts, images, sounds, memories, ideas, and stories. The project grows and changes incrementally. There is a long history of electronic fiction works that include user-generated content. But there are very few fiction projects that from the earliest, research phase attempt to harness participatory media as well as multimedia content in the way that Flight Paths does.